We offer Full Point Of Sale systems tailored for restaurants, retail and any other business requiring Point Of Sale system for NO UPFRONT COST! 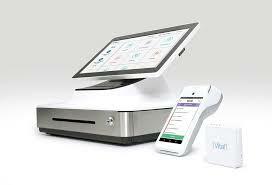 Poynt Pos is perfect for any merchant. It is a completely wireless device that can connect to extisting POS sytems. Perfect for retail and resturants looking to jump into the modern age and have a device that can be taken throughout the store or to customers tables to take their orders directly. With a back office reporting accessible from your point of sale, computer or smartphone. Designed for constant use in fast-paced environments, Clover Mini packs a powerful processor to move lines at lightning speed! Clover Mini is a modern register that quickly moves customers through checkout. Everything you need is at your fingertips: a colorful display that is fast and easy to navigate, a live dashboard, and back office reporting accessible from your point of sale, computer or smartphone. With Vital, merchants have the ability to quickly setup, create and change settings right on the system. With software created to help bars and restaurants run smoothly, users will find the intuitive interface easy to navigate and stay organized. Optimized with an interface for low-lit, fast-paced environments, servers can spend less time at the register and more time with guests. 1. Kitchen/station printer functionality requires a network kitchen/station printer add-on.